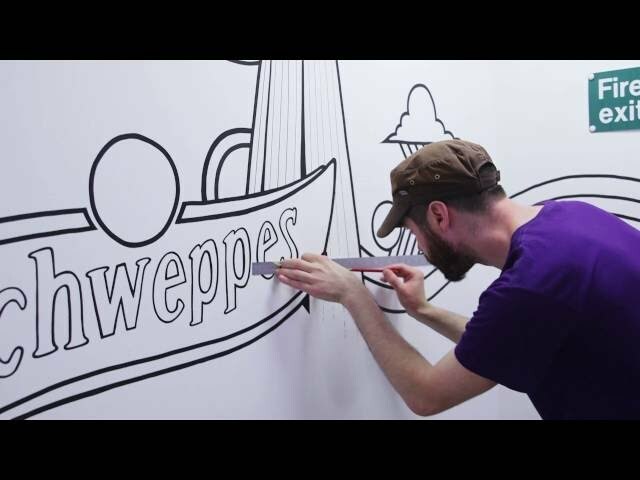 London-based graphic artist, Luke Embden describes his experience of being enlisted by Coca-Cola GB to help create a Coke-themed mural for our office on Wimpole Street, London. In 2014, when we moved to our new headquarters, we desperately needed to give the walls a lick of paint and add some Coca-Cola magic to the office space. To help us see the big picture, we asked young, creative artist Luke Emden to lend a hand (and a paintbrush). Watch the video to see how it all came together, and read on to find out more about Luke and his eye-popping work! As a self-professed doodler, when did you first start out? Playful, engaging and visually exciting for myself, but also for the viewer. I look upon myself as a graphic artist. There are elements of pop art within my work. You work on walls inside and out, screen-printing and many other mediums. What's your favourite canvas? At the moment it’s doing huge, often outdoor, large-scale murals where I’m spray painting because that’s really challenging. I love having to push myself, having to scale up the work to be over ten times as big as myself. So concrete or any kind of wall. There’s two. The first is obviously the Coca-Cola mural, because that was probably the biggest internal mural I’ve done to-date. It was three stairwells over four floors, each with its own theme, so that was a really big challenge for me. The second is a big, 400m2 mural I did last year in Croatia. The community piece was in a small village called Žuljana and a lot of the villagers got involved and helped to paint. View a full-screen gallery of the Coke-themed mural. How did you get involved in the Coca-Cola office mural project? It stemmed from doing work in various cities for sports charity StreetGames, where I met Liz Lowe, Coca-Cola GB’s corporate responsibility and sustainability manager. Coke is a partner of the charity, and I got on really well with Liz and she liked what I was doing. When the office move was on the cards she got me involved in a few meetings to see if I’d be interested and could create something visually exciting. What inspired your design for the Coca-Cola mural? The inspiration for it was the location in central London. There are a lot of elements, especially in the linear mural, where I tried to include iconic landmarks, from the BT Tower to the church at the end of Wimpole Street. I wanted to make people walking up and down the stairs relate to it and see it tells a story. Pop was also a big inspiration for me as well as the whole legacy of the Coca-Cola brand. When I started I was able to go through a huge Coca-Cola book with references and adverts from years ago. So it was really interesting to see all of that – old and new. Do you have a favourite section of the Coca-Cola mural? It’s hard to say my favourite part as I’m super happy with the whole project. Each stairwell has its own identity. I love the fluidity of the heart drips and the rawness of it – how the drips were spontaneous, I couldn’t control them too much. I also loved the third stairwell which is much more pop art influenced with ‘Enjoy’ and the big Coca-Cola bottle, I enjoyed the typography and the fluidity of it trickling down the stairwell. Each one’s got its own identity. It’s fun for people to stumble across them. I didn’t want it to be stagnant or one style throughout. There is something for everybody. But they all relate back to the brand. As well as StreetGames, you’ve also helped out with our ParkLives scheme. What attracts you to community-led workshops? I think it’s really important to be connected with communities wherever in the world, and to engage young people and adults. At ParkLives we gave people of all ages the opportunity to pick up a spray can or paint brush and just let go. I think it’s important for people to have a voice and art enables that, because there is no wrong or right. It’s about freedom of expression and having fun. How do you plan for large-scale pieces? What’s your work process? Firstly getting dimensions of whatever I’m painting and from there I brainstorm some ideas and have a meeting to get any suggestions. Anything that needs to be included I’ll take on board, then I’ll start doodling, loosely sketching ideas. I’ll quickly do a rough sketch of whatever comes into my head, and then yo-yo back and forth with the client. I’m doing a couple of murals for a creative start-up company, and then another mural for a digital agency in London. So I’m pretty busy which is great! Take a tour of our London HQ at Wimpole Street. You can see more of Luke Embden's work at www.lukeembden.co.uk.